I’m kind of on a monochromatic kick this month. This is a card we’ll make at the September Stamp Camp and one thing I love about Stampin’ Up! is that it is super simple to color coordinate. Marina mist cardstock matches marina mist ink (watercolored on the elephant’s hat), marina mist DSP and marina mist brads…. 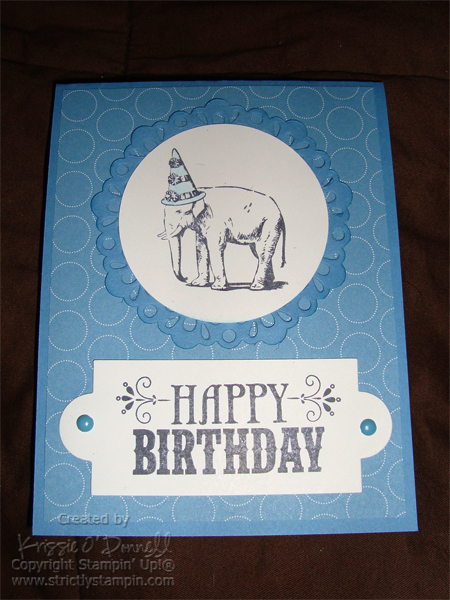 actually now that I look at the card… I accidentally used Tempting turquoise brads… oh well. Accessories: Aquapainter, 1/16″ Circle Punch, Apothecary Framelits, 2-1/2″ Circle Punch, Delicate Doilies Sizzlits, Stampin’ sponge.